Toon interested in 3 players, allegedly | NUFC Blog. The 22 year-old, Icelandic midfielder has spent a lot of his professional career in England. He was on Reading’s books from 2008-2010 during which time he was also loaned out to Shrewsbury and Crewe. Then he joined 1899 Hoffenheim in 2010 only to come back to England for his loan spell at Swansea this season. All-in-all, he has 128 first team appearances to his name and 44 goals with his spell at Swansea being particularly good where he’s bagged 7 goals in 15 appearances. Apparently we’re also interested in Galatasaray-based Columbian winger Juan Pablo Pino. The 25 year-old appears to be a fairly versatile player who can play on either wing or as a striker and he has 15 goals from his 119 appearances (and 5 goals from 3 games for Columbia). Pino joined Galatasaray – which is a surprisingly hard word to type by the way – from Monaco in 2010 for €3m on a 3-year contract. He seems to have had a falling out with Galatasarasarasaray manager Fatih Terim and has spent this season on loan to Saudi Arabian side Al-Nassr. The rumours about our interest in Jan Vertonghen are still bubbling away in various newspapers and ‘blogs too and I’m sure there’ll be many more before the end of the season and during the summer. I’d say no to the first 2 & not a chance for the 3rd as we’re unable to compete with teams like Arse-nil on wages & other stuff that persuade players to go to London clubs over the NE one’s…. I think the problem is, now that Ashley spent £10m on Cisse in Jan, most crap-loids & fans seems to think that we’ll be doing that again this summer but the truth is, we could get 2 or 3 decent players in for £10m like Tiote or Cabaye which is what I’d prefer as that will give the squad some depth instead of signing just 1 player…. We certainly need somebody! I was watching the Bayern v Real Champions League semi-final last night and, whilst I enjoyed the game, I couldn’t help but wonder how United would have got on against either of them. Then I consoled myself that Chelsea, who are also in the other semi-final, are below us in the EPL!! If you piece together Llambias’s missives what seems most likely is Tiote to London/Manchester for 20-22m and incoming striker/winger; defensive midfielder;centre back and left back for 16m using surplus for wages and fees. It may all happen pretty much at the same time to keep the Toon Army abated. Variables are Ba; Simpson; Guthrie – all 3 with end of cotract and sell-on clause issues. NUFC looking at out and out goalscorers to have a replacement ready if Ba goes. 7m will bring in a decent striker from Holland; France etc. Reckon you’re on the right tracks there mate. The ones we certainly don’t want to lose are the likes of Cisse, Ben Arfa, HBA and Colo. I reckon a lot of supporters are resigned to losing Ba if he wants to leave – but are hoping he’ll want to stay. I get the impression the Tiote deal has already been done and we’re just being “warmed up” by Owl Heed. With the approaching changes in regards to home grown players, it appears the club will have to add a couple. As we are becoming like most other EPL sides heavy into johnny foreigner. In which case a Moses or Hoilett, hell! like to have both, would be nice to have players with pace, power and goalscoring skills. Siggurdsson is a decent player, but not for eight million thanks. Besides we should be looking at some home grown, if in fact UEFA intend to enforce the rule. One guy i would also like to see at the club is Adam Johnson, a finesse player who not only gets his goals but lays on a lot more, could imagine him alongside Cisse on the right, with HBA on the left, what kinda front three would that be ? Same thing with both Moses and Hoilett. I understand we cant sign em all, but with Hoilett on a free and apparently Citeh have to sell Johnson in order to buy, plus the kid has openly stated he’s a NUFC fan and has been at the club previously. Hey! how often does the opportunity come to get a good young local lad, who’s price can only go up with time, playing for us ? I say go get some home grown! No way Ashley is gonna lay out that kinda dosh, Arsenal bound. I’ve been a fan of Moses for some time – and he’s nabbed me a canny few points for my fantasy football team this season LOL!! Smashing player – problem is everybody knows it now. On the news front, looks like wor Mick is back doon the big market like, poppin a few Broon Ales with the lads. Reminds me of the old addage, from the sublime to the ridicules. Appears we are seriously looking at “Bas Dost” an up and coming young striker ? Does that mean a deal for Ba is in place ? We read more reports on Krul going to Chelsea for around 15m., hopefully there’s no truth to it. Tiote for 20m anyone? take it in a NY second! Bring in Vortinghen and Sissokho at LB, viola ! Pardew, claims a humble beginning,(thats playing in non league football up untill he was 25 or so)playing with Company directors and binmen, made him what he is to-day. A lesson to all you youngsters out there. The Krul story has proven how much crap bounces around T’Internet. The Sunday Mail ran the original, totally fabricated**, story. Ever since then, every news outlet, blog etc has run the same story almost word for word!! If you say something again and again, people might start to believe it. ** “totally fabricated” – it has to be, they guessed a transfer fee that’s too much of an insult to even count as a joke! watched moses against Man U and he looked lively, and seemed to favour that inside forward/winger cutting in role which would suit if we lost Ba and kept Cisse and HBA. I think most young players not yet established, want to be at sides where they can showcase their abilities. And Wigan are such a club, not a great deal of competition for Moses, plus he is learning from Martinez, not to mention a youngish side that has some talent and play an entertaining style. I certainly would like to see them survive the drop, where their chances appear good. No need to hold a grudge, AussieToon. Our very low bid for him was turned down by the then administartors of Crystal Palace. Wigan’s bid was much higher and theirs was accepted. That’s why he plays for Wigan. 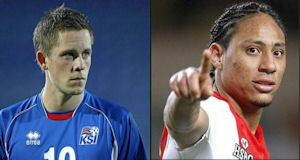 Sigurðsson is a beast, it would be great if Newcastle got him. However, I don’t think that it will be easy to take him away from Swansea. This is based on tiote and ba being sold by the way which I hope doesn’t happen and is also a more attacking midfield set up. But if worst comes to worst we find ourselves another few million up with some excellent transfers courtesy of graham carrs scouting network. i was under the impression that we’d matched Wigan’s bid but he wanted to move out of the championship. Pino looks a canny hand like, can’t say I’m dissapointed that we are interested in a Columbian. Considering we may be among the elite next year, the last Columbian who played for us scored a hat-trick against Barcelona.